At Hot Spot, we don’t think you should have to empty your pockets to look great. Keeping this in mind, we are always offering specials and deals to save you cash. All you have to do is stop by our convenient location to take advantage of these unbeatable savings! 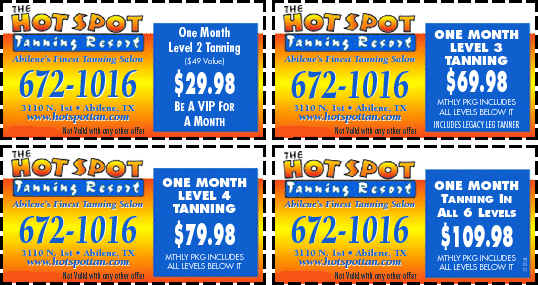 Includes: Two Weeks of unlimited tanning, Bottle of tanning lotion and eyewear. If you’re interested in learning more about any of our tanning options, all you have to do is call (325) 672-1016. Our knowledgeable team would love to tell you more about our innovative tanning technology. Click on a file to download coupons.